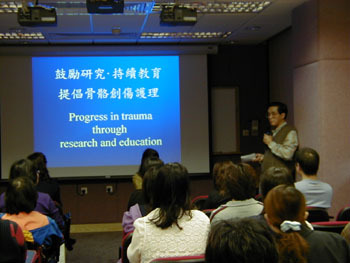 During the past years, with genuine support from the AADO Council, the Nurse Subcommittee has organized various educational activities to promote trauma nursing care. Apart from delivering high quality trauma care to our clients, we are also looking into their psychosocial problems, occupational safety for our staff and promotion of health programmes for the community. One-day Course on Automation & Computer Aided Technology in Ortho. Trauma.